Airbnb is changing the world for travelers one rental at a time. The CA company began in 2008 and now offers over 1mm listings in 34K cities. Ever dreamed of a night close to the Eiffel tower in Paris? Airbnb knows someone there who will rent you a room with a view for less than $100. An old British castle with a gentle ghost? No problem, they have those too. A nomad house in Tucson, a giraffe manor in Kenya, an igloo in Slovenia or a tree house in San Francisco...this peer to peer room sharing system has an answer for everyone. Millennials find this to be a natural progression as they are a sharing generation after all. They find it quite normal to rent out a book, a tool or a car. Uber, Lyft and Sidecar, are a little different than actual shares in that the car comes with a driver, but these ride services have changed the way the world also views a taxi ride. Car sharing services like Car2go are causing people to reconsider whether they even want to own a vehicle. Sharing is ubiquitous and a recent poll by researcher Penn Schoen Berland points out some interesting facts. It found that 33% of millennials are interested in renting out their stuff to boost their income. The first item they list is books, the second relates to their cars. The typical family vehicle is parked 96% of the time, so it certainly is worth exploring whether there is an opportunity to make money with the sleeping beauty. Ford wants to be at the forefront of this trend and just announced a pilot program for a peer to peer rental car experiment. The carmaker sent letters to 14K drivers in America that they know well. These owners have loans through Ford's financing arm and if they wish to participate, they can rent their vehicle by the hour to other drivers through Getaround. Ford selected young cities in the US to conduct its experiment: Berkeley, Oakland, San Francisco, Portland, Chicago and Washington DC, and is testing a similar formula in London with 12K customers. If the pilot project succeeds, Ford will change the way it looks at a borrower's finances. They can take into account the extra dollars an owner can generate renting out the car, should that owner determine it is a part of their plan for the vehicle. Getaround says that car owners earn on average $600 per month, income that should allow certain consumers to buy a car despite a spotty credit history. It could also help consumers to buy a nicer, more expensive vehicle. But what if a renter trashes the car or has an accident? The whole point of having a partner like Getaround (which takes a 40% commission from the rental) is that they will screen users and owners before they are approved. There is also associated insurance that covers damage by renters. Wear and tear on the car will probably be greater which could cause trade-in values to differ. 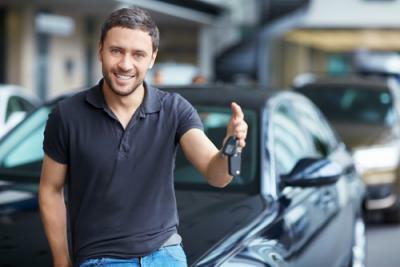 Sharing cars will require rethinking many aspects of their financing. Banks who are in the auto finance business should consider these possible sources of income when qualifying borrowers, as they could significantly change the risk/reward equation. Time will tell if renters and owners broadly adapt the idea of renting out their vehicles and what Hertz and Avis will do to respond to this threat. Given the most likely adoption will be in urban environments, this kind of program could also be a hit on college campuses and other places where people live in more concentrated housing arrangements. Community banks in their efforts to adapt to changing customer preferences are primarily thinking in terms of mobile access, but rapidly changing lifestyles can change customer banking needs in other ways. Be certain your bank's consumer lending area is aware of the sharing economy and the various opportunities for both your customers and your bank that it might bring. It was a quiet day after a volatile week, Treasury yields rose 2 to 3bps on the short end. August reports for Chicago PMI and Dallas Fed Manufacturers Activity. 1) Northfield Bank ($3.1B, NY) will acquire Hopewell Valley Community Bank ($485mm, NJ) for $54.9mm in cash (25%) and stock (75%) or about 1.47x tangible book. 2) Avadian Credit Union ($607mm, AL) will acquire American Bank of Huntsville ($127mm, AL) for an undisclosed sum. 3) Union Federal Savings and Loan Assn ($108mm, IL) will acquire First Federal Savings and Loan Assn of Kewanee ($64mm, IL) for an undisclosed sum. Bank of America has agreed to pay $36mm to settle a lawsuit from 365 employees that it failed to pay overtime to residential staff appraisers. fTLD Registry Services reports 2,400 banks have filed applications for Dot Bank domain names since they became available for purchase in May. Fed Vice Chair Fischer said that an interest rate increase in Sep is still in play and that the Fed has two weeks of data it will review before making a decision. Recent market turmoil has many market players pushing rate hike expectations to Dec, so this is an interesting comment by someone sitting at the decision table. Research by SNL Financial finds 53% of non-millennial smartphone mobile banking app users say they are satisfied with their apps vs. only 36% of millennials. Millennials say they want savings account rates (19%); mortgage calculators (17%) and the ability to compare mortgage rates (16%) as added features. Online lending companies such as LendingClub, Prosper, OnDeck and others will now have to follow user laws on loans made through their websites following an appeals court judge's ruling. As such, the companies will have to apply state caps on interest rates as applicable going forward. The FBI reports hackers have stolen $1.2B from more than 7,000 businesses in the past 2Ys, most often using a scam known as business email compromise (hacking the CEO's account and then sending emails from that account telling employees to transfer money).